In the previous post of this series we started looking into OWIN and Katana. We also looked at a small, very basic Console based web server to see them in action. We’ll continue digging into how these technologies work. 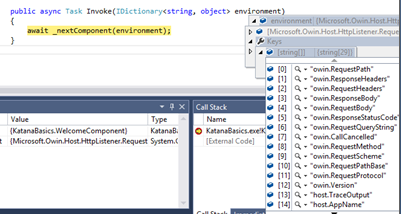 We’ll build upon the demo application we started working on in the previous post so have it ready in Visual Studio. The application function, or AppFunc is a tool that defines how elements process incoming HTTP requests to the server. It provides a delegate which returns a Task and accepts an IDictionary of string and object. We saw an example of such a Func in the first post of this series. The dictionary represents the request environment. Recall the Environment property of the IAppBuilder interface which is also of the same dictionary type. We also said that this structure is characteristic of OWIN as it lacks any higher level abstraction. It is not a dictionary of, say, RequestParameter and RequestKey with built-in properties which we could expect in a built-in object oriented .NET class. This particular dictionary includes all types of data about the request from and the response to the client: headers, cookies, server variables etc. The application function delegate always returns a Task to adhere to the asynchronous programming model of modern .NET applications. At this point you should be familiar with the await-async keywords in C#. If not, then start here. You’ll probably notice that this is quite low-level programming compared to writing a “normal” ASP.NET web application where you get all HTTP related tasks for free from the System.Web library and IIS as the default server. In OWIN you are free to build all components required to fulfil a request. The components will be independent from each other but still able to work together in a decoupled fashion. One component may check the request headers, another one the authentication cookies etc. Every component will have an application function that can be invoked externally. The components form a chain of actions where each component calls upon the next component’s application function in the pipeline using the data in the Environment dictionary mentioned above. As the dictionary object only contains strings and objects the chain remains very loosely coupled. So we await the next component and pass along the incoming environment variable to its constructor, just like the way how WelcomeComponent would be called in the pipeline. A short aside: the Invoke method must be called Invoke, so I didn’t just pick this name. Change the method to something else, like MickeyMouse and then run the application. You should get a System.ArgumentException complaining about a conversion error. So there are 29 keys and 29 values – this number may change in future updates to the OWIN-related assemblies. Looking through the key names it will be clear immediately that it’s possible to extract just about any information related to the HTTP request: path, headers, request method, request body etc. This environment variable will make sure that the HTTP request properties will be available to every component in the chain. Some of them are actually specified as compulsory elements by the OWIN specification. Remove the ‘async’ from the method declaration as the WriteAsync method already returns a Task. Run the application and navigate to localhost:7990 in a browser. You should see the plain message we provided above to the WriteAsync method. This was in fact a very low level Katana component, probably the lowest level possible. The methods we tested with IAppBuilder, i.e. Run and UseWelcomePage, use the same technique behind the scenes. They are simply wrappers around a much more elaborate Invoke method. This produces the same behaviour as before, just with a little nicer syntax. You’ll notice that the UseWelcomeComponent method call looks very much like UseWelcomePage – the implementation of the latter is probably slightly more involved however. Components in OWIN are also called middleware as they sit in the middle of the processing pipeline. We’ll keep looking at OWIN middleware in the next post. Andras, thanks for the great Post!! If the execution doesn’t hit the break point in Invoke(), what could be the issue?